Get sinus relief from Dr. Bequer - A board certified ENT with over 30 years of experience! Can a Sinus Infection Cause Hearing Loss? The last thing you want to be asking yourself on top of “When is this sinus infection going to end?” is, “Can a sinus infection cause hearing loss?” But if that’s the situation you find yourself in, you want answers, and quick. So: “Can a sinus infection cause hearing loss?” In short, yes. But how? What does sinus infection hearing loss look like? How is it best treated? Sinus Solutions of South Florida is here to address these questions in-depth. In the process, we hope to help you identify a pathway to better hearing, better sinus health, and better everyday living. Psst… If you’re wondering if you have sinusitis, a sinus infection, or a cold, check out this article on the difference between sinusitis and a cold. Chances are that if you’re wondering, “Can a sinus infection cause hearing loss?” you’ve already got an inkling of what might be behind this symptom. The most common form of hearing loss due to a sinus infection is caused by severe congestion and sinus blockage — specifically, sinus blockage of the Eustachian tube, a small section of your ear that helps regulate pressure. Fluid in the Eustachian tube can cause muffled hearing. Many people equate the sensation to that of descending in an airplane, being underwater, or even having earplugs in. Changes in hearing such can be distressing. In general, it’s wise to visit a doctor as soon as you notice any difference in the quality of your hearing, but to have hearing loss coupled with a sinus infection may indicate that your infection has become more severe, and thus definitely warrants a visit to your ENT. Can blocked sinuses cause tinnitus? 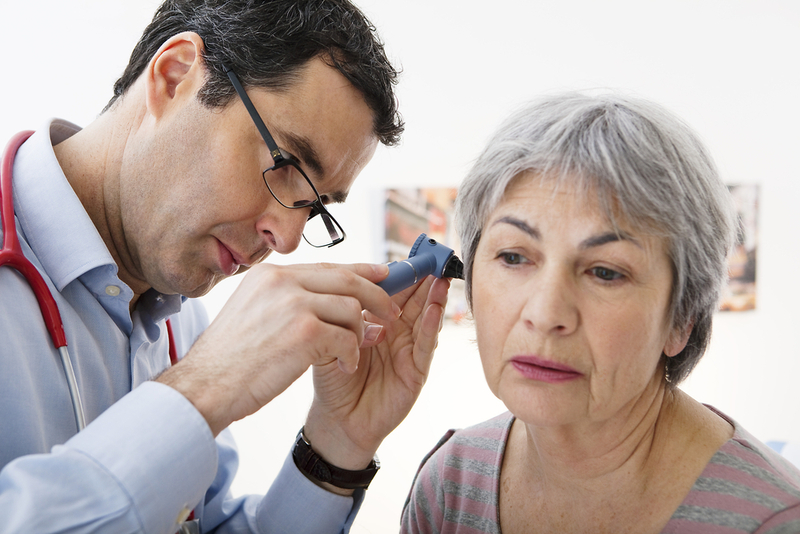 Tinnitus is a form of hearing loss that can be brought on by sinusitis. There are many different reasons people succumb to tinnitus (with excessive noise being the number one cause), but ear and sinus infections also cause an unexpectedly large percentage of tinnitus cases. To simplify things, tinnitus also happens because you’re congested. To review: when you get a sinus infection, the tissues in your sinuses become inflamed and swollen and may start to fill with fluid. In turn, inflammation and swelling can create a buildup of pressure which blocks airways and leads to an uncomfortable ringing noise in your ears. Tinnitus during sinusitis creates a ringing or buzzing sensation in your ear that can become rather loud. At first, you may experience tinnitus intermittently; however, over time, it can become constant. Note that certain medications can worsen your tinnitus symptoms, including some antihistamines. Make sure you consult with a doctor before taking any medications. Now that you’ve established why and how the answer to “Can a sinus infection cause hearing loss?” is yes, you are one step closer to finding relief from the discomforts that come with hearing loss. How do you “unclog” an ear from a sinus infection? Luckily, sinus-induced hearing loss and tinnitus, is usually temporary and can typically be eliminated. You simply have to get your sinusitis under control. To treat a sinus infection that’s caused hearing loss, it’s best to consult your ENT doctor in Florida. Dr. Bequer is a board certified and fellowship trained ENT doctor in Tampa and West Palm Beach. With various treatment options available, including balloon sinuplasty, Dr. Bequer and his staff can help unblock your ears and even give you relief from other sinus-related symptoms. Balloon sinuplasty is a minimally-invasive, in-office procedure that can help unblock sinuses without the use of incisions. For more info on balloon sinuplasty, visit our Balloon Sinuplasty: Before and After page. Sinus Solutions of South Florida is proud to provide citizens of Tampa and West Palm Beach with quality care for hearing loss. To meet with our experts, call 561-285-2099 or go online to request a consultation today. Dr. Bequer is a leading South Florida ENT & sinus doctor, providing nasal, sinus, and snoring relief through balloon sinuplasty and various procedures the in West Palm Beach and Tampa areas. © 2018 Dr. Napoleon G. Bequer, MD. All Rights Reserved.